January | 2014 | The Glyn Watkins Show Page. 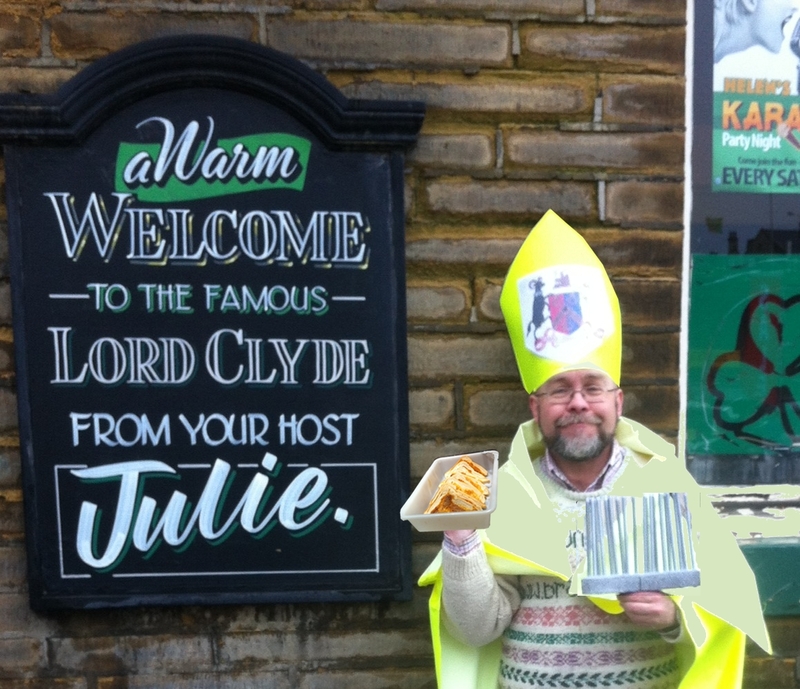 The organiser of a walk on Saturday to commemorate Bishop Blaise, Bradford’s forgotten saint, has just announced it will be calling at the Lord Clyde, on Thornton Road, to sample what he describes as the ‘Yorkshire ethnic delicacy’ of bread and dripping! for pies. After that we can we fill up a few corners at the Lord Clyde with the joy that is bread and dripping! It’s just a shame it has no vegetarian alternative, but there will be more cake waiting for us at the Sir Titus Salts at the end of the walk for anyone who is still hungry. The walk is entitled ‘A Guided Walk Through Bradford’s Hidden Histories.’ and is open to all. Walkers are asked to be at Glyde House, at the bottom of Little Horton Lane, for 11.00. The walk is about 3 miles long, will finish by 15.00. and collections will be taken. Pie Poetry & Proud of Bradford Show just £4 in advance. Buy your ticket before Sunday 2nd Feb. from Glyde House or me and save a pound. The show starts at 20.00. will finish before 22.00 and have time for you to buy pie and peas at a very modest price. The pie will be meat and potato or cheese and onion. There will be poems that rhyme and many tales with pictures, including ghost graveyards; lost trains and found cannon balls; the woman who built a pub, married one of Bradford’s first policemen and then drowned herself; and ups and downs of Bradford City, including me being a director for the day, and why Bradford City stopped the director for a day scheme! I have copied the list at the bottom of this entry from John James’ HISTORY AND TOPOGRAPHY OF BRADFORD MDCCCXLI. As the book was published just 16 years after 1825 and the last ever celebration of St. Blaise by the whole of Bradford, we can be certain it is correct. The event was organised by the wool-combers, who were self employed skilled men. Their job was to separate the long and short hair in a fleece (the tops and noils) using big metal combs heated in a pot of burning charcoal. The tops were used to make higher grade worsted cloth, the noils for woollens. The wool-combers had been in a very strong economic position, but things were changing fast in 1825. They went on strike 4 months after the triumph of St. Blaises’s day, lost, and St. Blaise was never celebrated again. Still, if you look at how big, and complicated, the procession was you cannot help but be astonished by it. There are 860 people counted in the list, plus 3 bands and uncounted numbers of charcoal burners, shepherds and shepherdesses and colour (or flag) bearers. So surely over a thousand in total! All done when a man on a horse was the fastest way to communicate! The spelling and spacing is as the original, so this is now a primary source. The Spelling of Blaise, or Blaize, varied even in 1825. Now the two streets named after him in Bradford use a s instead of a z, and so do I. Listing Bradford’s Bishop Blaize Procession on 3rd Feb. 1825. Twenty-four Woolstaplers on horseback, each horse caparisoned with a fleece. Thirty-eight Worsted-Spinners and Manufacturers on horseback, in white stuff waistcoats, with each a sliver of wool over his shoulders and a white stuff sash: the horses’ necks covered with nets made of thick yarn. Six merchants on horseback, with coloured sashes. Three Guards. Masters’ Colours. Three Guards. let coloured coats, white stuff waistcoats, and blue pantaloons. Six Guards. King. Queen. Six Guards. Guards. Jason. Princess Medea. Guards. caps and various coloured slivers. Four hundred and seventy Wool-combers, with wool wigs, &c.
Forty Dyers, with red cockades, blue aprons, and crossed slivers of red and blue. If you could visit and ‘like’ the page or the events that would help. Sharing would be even better. Burns then Blaise. 25th Jan. Saturday Sparrow. Guided walk through Bradford’s hidden histories. 1st Feb. Start Glyde House 11.00. Pie, Poetry & Proud of BRADFORD show. 2nd Feb. Glyde House. 20.00. The Comedy & Errors – What Bradford has done for fun. 3rd Feb. The Theatre in the Mill. The Comedy & Errors – What Bradford has done for fun. 3rd Feb.
Route and details of The Bring Back St. Blaise’s Day walk, Saturday 1st Feb. The walk is along much of the route of the last St. Blaise procession in Bradford. It is in 4 parts, and is rough 3 miles in total. There is one set of steps, and one small section over potential mud, but wheelchair accessible alternatives are available for both. The walk will be guided by Glyn Watkins, who will be dressed as a bright bishop. You are welcome to dress up as well. The walk will pass 6 vanished churches, chapels and graveyards; the site of the cockpit, the bowling green, markets, and many vanished pubs. It will include the story of the sieges of Bradford, and the canal that caught fire. 11.00. Gather at Glyde House. Refreshments will be available. Glyn will be showing pictures of old Bradford and talking about the route. 11.30. Set off. Amongst others there will be pauses by J.B.Priestley’s statue; City Hall; and the Wool Exchange. 12.00. New Bradford Playhouse. Home made cakes available from Megan, a grand cake maker. 12.30. Set off. Paper Hall; Bradford Cathedral; down the steps; St. Blaise Way. 13.00. The Sparrow Bier Cafe.. Pie offered. 13.30. Set off. Oastler’s Statue; James Gate; Southgate; Goitside; across the waste ground behind The Lord Clyde to view Bradford’s mill goit. Around 14.00. The Lord Clyde. Bread and dripping offered. Before 14.30. Set off. Bradford’s first mill; Bradford Beck; Westholme Street; the first Mannville; down Great Horton Road. By 15.00. Finish The Sir Titus Salt. Glyn will have coffee vouchers and cake, and probably sandwiches, will be offered. Glyn Watkins’ one man show about performance, place and Theatre. Sports, supping, parading & other loves of the common people. Temperance Halls, theatres & Playhouses and what Variety! 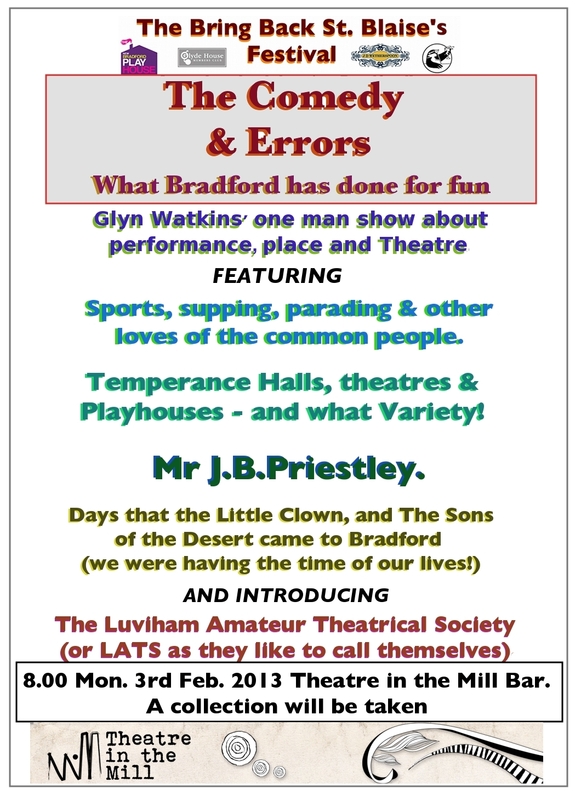 The Luviham Amateur Theatrical Society (or LATS as they like to call themselves). A collection will be taken. This is only an issue if you use http://www.bradwan.com to get to my page. I own the URL’s bradwan.co.uk and bradwan.com . Normally they both take you to the site bradwan.wordpress.com. It is easier for me to give out and means I can direct traffic to a new or different site if I move from wordpress. bradwan.com should directing to this wordpress page for just my shows (priestleypie.wordpress.com). I pay a company called 123reg to register my URL’s and direct traffic. They appear to be at fault, and badly so.